It's completely wild, but I'm proud of myself! Hey guys. I've been wondering how to establish a V shape for my scanning.. I know there is cardboard box approach, but I don't like it much (also it requires a table or something, so you can tape it on, right? ), so I figured out kind of "mobile" approach, using things I already owned (for the most part). By chance I figured out that my keyboard stand is X shaped and I checked if a book can be placed there. Turns out it can, you just have to flip it upside down, so the metal piece used for adjusting is on the bottom. Next step was the glass – I asked around if they cut glass in a local hardware store, but nope. I thought that I could just buy a cheap photo frame (I got 31x26 cm one) and extract glass from there. Adjustments I made so far: cut a piece of cardboard from the frame (it had this extra frame thing so you could insert multiple photos inside) and taped it to one of the railings of my keyboard stand – that's because it has a little metal piece attached to the other side, so I made this to completely even things out. Then I took the back piece of the frame, put it more or less evenly in the middle and marked the spots, so I can have it always in the same position. I think I should probably tape it lightly to the railing every time I'll do scanning to avoid it being moved around.. and finally, a glass piece, works really nicely, I tested it with a small book which would immediately fold without it. But with the glass it's so good! I have a very slight reflection of my room lights, but from my testing it doesn't seem to effect the final pdf. For the camera I use my iPad attached to a microphone stand. I tucked a stool as close as possible to the keyboard stand and put a book below – turns out it's at the perfect height now. Oh, and it lies down 41 degrees – if that was good even for a small thick book, I assume it's fine. I'm not sure if distance should be closer, but that would be tricky to achieve – unless I find some pillar-shaped stand or something. Also I do have microphone stand, but its lowest height is way too high. I could theoretically put it on the other side, but I'm afraid that shadows cast by it would ruin things (also, it would be more cluttery). As I do mostly sheet music, it feels perfect (sheet music books are not nearly as thick as your regular books). But, as tested with a smaller book which wasn't thin at all. For operating, I can sit on my bed and reach to swap the pages and snap a photo. If I had to be standing, my back would be destroyed quickly. Anyway, I am very happy that I managed to spend almost no extra money (frame was less than 7$) and improve my scanning vastly. 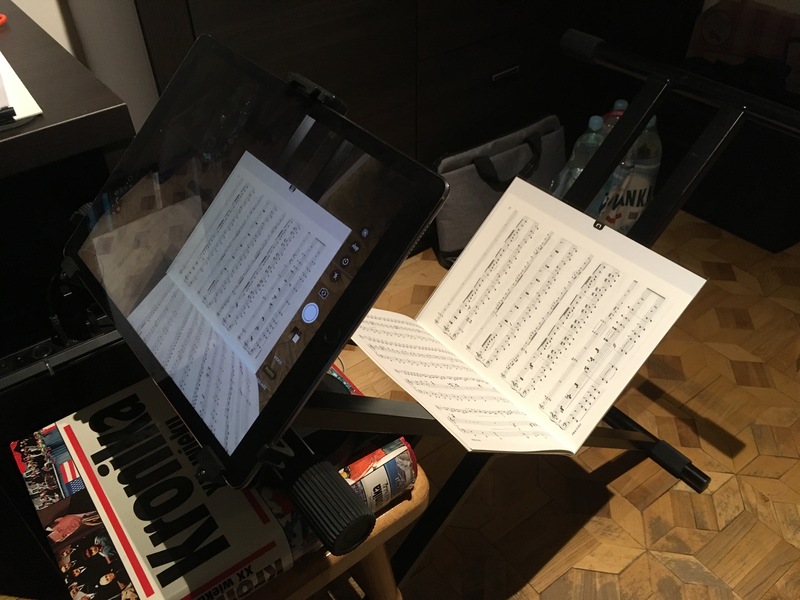 Before I was holding my iPad top down over the desk.. well, the benefit was I could do 2 pages at a time, but if it wasn't perfectly flat and I'd end up with some curves – which is probably even more annoying when reading music rather than text. I'm glad I found this site! Without it I'd be still struggling.. and not using Scantailor Advanced, which is amazing. I'm aware that people are doing insane and impressive builds, so that might seem like nothing. Still, quite a deal for me, so just wanted to share. Cheers!